George Georghiou graduated from King’s College London University (UK) in 1979 obtaining LLB (Hons), following which worked in various firms of solicitors, specialising in property and contract. In the 80’s Mr. Georghiou opened his own real estate company in Kings Cross, dealing with acquisitions, property developments, sales, lettings and management. 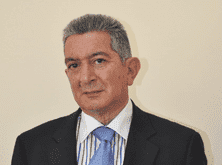 George Georghiou was awarded to the position of Member of the National Association of Estate Agents from 1994. Since 1999, Mr. Georghiou has been retained as a consultant by numerous property companies on investment and development. As of 2005 Mr. Georghiou joined Feod Group as Managing Partner. business organisation and management abroad.